A biologist and a qualified anatomist from England, Richard Owen was born in 1804. He is known as the renowned person who coined the word “dinosaur”. He had many scientific achievements especially in the field of vertebrate anatomy and paleontology. What was the Important Discovery of Richard Owen? What was the conflict between Owen and Darwin? Born in July 1804 in Lancaster of England, Richard completed his initial schooling at Lancaster Royal Grammar School. At the age of 16, in 1820 he started his apprenticeship with a local surgeon giving a start to his field of medicine. At the local prison, one of his assigned task was to perform post-mortems. In the year of 1824, Richard started his medical learning in the field of anatomy at the University of Edinburgh of Scotland. He completed his medical studies at St. Bartholomew’s Hospital of London in the next year. With time, he moved towards scientific research from the medical field and later in 1827 with the advice of John Abernethy, at the Hunterian Museum Owen accepted the designation of an associate curator. In short duration, his reputation grew and Richard was chosen as a member of the Royal Society in 1834. In 1836 he was appointed as a Hunterian professor. He then became a Fullerian professor of comparative anatomy as well as physiology at the Royal Institution. After leaving the medical practice and devoting his time to research, he was appointed in the natural history departments of the British Museum as a superintendent in 1856. He held this position until he retired in 1884. On retirement, he was honored as a Knight of the order of the Bath. After his retirement, in his 88th year, Owen lived at Richmond Park and resided there till his last breath. Richard died in 1892. 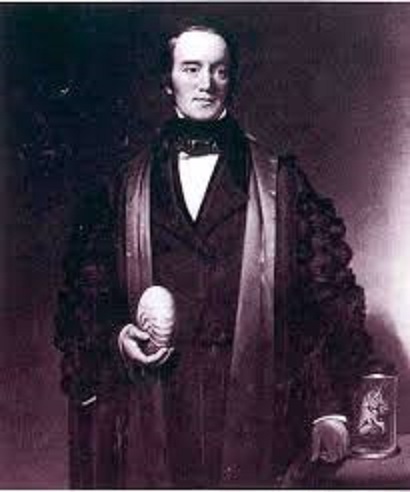 Owen famed much acclaim by his 1832 publication of Memoir on the Pearly Nautilus, however, he made an important contribution in the field of Zoology and anatomy of many invertebrates that included additional mollusks, sponges, brachiopods, and arthropods. He also discovered a parasite called Trichina Spiralis in 1835 which causes disease trichinosis affecting humans. His main area of work was the paleontological and anatomical study of vertebrates. Richard’s studies consisted of a wide range of extant and extinct fishes, birds, amphibians, mammals and reptiles. In particular, he made studies of their teeth’s. Owen discovered and named a group of extinct amphibians labyrinthodonts. He identified the fish clade Teleostomi and researched on dodo, Greek Auk, Kiwi and many other birds. He did extensive research on extant mammals like marsupials, monotremes, and apes while in extinct species he studied giant armadillo, kangaroo, wombat and ground sloth. Owen is specifically known for his study and naming of the group called ad Dinosauria or dinosaurs. Owen produced the first life structure of dinosaurs and showed it in the exhibition of 1851. Further, more improvised version was produced. He also completed a prominent work on Archaeopteryx which is an extinct animal that has the attributes and features of both reptile and a bird. However, many errors were figured out by Thomas Huxley in Owen’s work. “Monograph of the Fossil Mammalia of the Mesozoic Formations” in 1871. Owens named is linked with both Darwin and his theory of Evolution. Owen was introduced to Darwin by Charles Lyell, where Owen agreed to work on the fossil bones which were searched and collected by Charles Darwin in South America. Darwin thought that extinct behemoth creatures such as sloths and rodents were relatives of the similar sized creatures in Africa while Owen revealed that these creatures are related to current species of the same locality. The conflict was one of a few which forced Darwin to formulate his own ideas. Meanwhile, Owen talked about his own theories that were influenced by Johannes Muller which was living matter had organizing energy that is a life force directing the growth of tissues also specified the duration of life of the species as well as an individual. But Darwin was reluctant on his thoughts of evolution. Owen, in today’s time, is known as someone who opposed the idea of the evolution of species and this was mentioned by Darwin himself in 1859 in his first edition of the book ‘Origin of Species’. He described Richard as the one who firmly convinced the species immutability. Richard was the first one to distinguish between homology and analogy. He made a very little contribution to the theory of evolution, however, his work supported the descent modification like noting changes with forerunners of horses and crocodile. He made an enormous contribution in all his major areas of anatomy, zoology, and paleontology while Owen became famous for coining the term dinosaur. He and George Cuvier credited themselves with the discovery of the lguanodon, however, he excluded any credit for Mantell who claims to discover them originally. In the Hunterian Museum of London, there is Richard’s bust by Alfred Gilbert. A blue plaque in the honor of Owen has been displayed at Lancaster Royal Grammar School. “Diploglossus Owenii”, a species of Central American Lizard was named in the honor of Owen by French herpetologists.